What a day to get sick! In between naps as I lay suffering from god only knows what bug that has rendered my body achy and poured some fluids into my lungs, I received two notices from two ends of the film industry that make my illness pale in comparison to that of the celluloid image. A fellow film programmer forwarded me a press release issued by NATO, that would be the National Association of Theater Owners and not the folks currently conducting bombing raids over Libya, which was a sort of call to arms for theater owners and operators. Who was the fight against? Well the studios of course, who’ve decided to shorten the window of release between theatrical and VOD, something that smaller theaters like ours succumbed to several years ago when many of the indie distributors often eliminated them completely. The theater owners were of course no consulted about this, and it appears as thought perhaps all the majors made this decision as an industry wide mandate. If that weren’t enough cause for concern, my industry insider also included a quote from a speech delivered at something called CinemaCon, an excerpt of which I’m including here. Whoa… film prints unavailable as of 2013?! A few studio repertory divisions are already making it very difficult to secure prints for retrospectives. But when your multiplex goes all digital that suggests a seismic shift in the way films are exhibited FOREVER. And that my friends is just item number one. Item two comes from the caretakers of some of experimental cinema’s (you read correctly) finest treasures; Canyon Cinema. It was the kind of plea that we received back in February of 2009 from the Filmmakers Coop, who were threatened with eviction. Canyon labeled their plea an “Important Message To The Film Community” and starting with the the sentence, “This is a very serious letter.” And it is very serious. Canyon is going through some difficult financial times, and are considering some drastic measures. Their appeal while not exclusively financial, is also for creative solutions, of which they offer a few possibilities. In the opening paragraph they suggest part of this trouble comes from the fact that universities are purchasing dvds instead of renting prints for classroom use, which of course they acknowledge is due to changes in budgets and equipment. Our own Search and Rescue program was born out of this quagmire a few years back. My illness seems to have coincided so perfectly with that of the moving image. What a day! The Seattle nonprofit cinema has been approved for a liquor license and plans to begin selling beer and wine during evening movie screenings and events beginning Friday, April 22. Seattle, WA — Northwest Film Forum will soon be selling beer and wine! The Capitol Hill film arts center recently received a Nonprofit Arts & Entertainment liquor license and intends to sell alcoholic beverages every evening during box office hours beginning April 22, 2011. The cinema will continue to be open to filmgoers of all ages. Over time, the organization will make adjustments in their lobby to better accommodate patrons who choose to arrive early for a drink. A plan for bench seating and cafe tables is in the works, among other updates. Film Forum programs will continue to be open to all ages, with the exception of some special events. Details about what kinds of drinks are permitted in the cinemas are still being worked out before the first day of alcohol service. The first night of alcohol sales will coincide with the opening night of Bummer Summer, with filmmaker Zach Weintraub in attendance. Bummer Summer was the jury prizewinner of last year’s Local Sightings Film Festival. Posted in Uncategorized | Comments Off on We’re selling booze! If you saw Tom McIntire’s Greenspoke at the 2009 Tacoma Film Festival, then you didn’t see it. Huh? To clarify, you couldn’t watch the short in the way originally intended by its writer/director. Besides the inescapable drop in visual quality when downconverting his high-definition footage to a DVD format, theater projection shifted the film’s overall color away from the tones McIntire (who also edited) had worked to achieve. As the names Greenspoke and his newest work, What Light, suggest, this filmmaker places a strong emphasis on the interplay between shadow, light and color (and what is color but light emitted at different wavelengths?). He received a degree in studio art from Arizona State, and understands that decisions regarding contrast or composition will affect the final impact and meaning of each piece. With “ninety-five percent” of the project wrapped, McIntire is busy on – what else – color correction. For more updates, follow What Light on Facebook. Don’t you wish you were 14 again! Are you a first-time animator or a seasoned filmmaker looking to pick up some new tricks and skills? Come join us for two solid weeks of animation! Classic Disney films and TV shows like Gumby were all made before computers and demonstrated a variety of hands-on animation styles that are still used today in films like Coraline. Students will learn these traditional animation techniques by working with drawings, collage, clay, puppets or objects. Each student will create his or her own short film by going through the whole process: planning a project with scripts and storyboards, using movement to give characters expression, and finishing pieces with voiceovers and sound. Finished films will be compiled on a DVD for students to take home and share. Scholarships are available. Email dave at nwfilmforum.org for more information. Taking a hands-on, in-depth approach, students will spend time learning all aspects of filmmaking, from story and concept to finished product. The two-week class will begin by focusing on characters and plot, storyboarding and planning before the shoot. Students will then use professional video cameras, microphones and lighting kits to create their films. Teams will come up with multiple pieces, perfecting their craft by trying out different roles and ideas. Students can choose the method and style of filmmaking, even focusing on different variations of an idea. Their final film will be shot, edited and polished in time for a screening in the Film Forum’s theater on the last day of class. Northwest Film Forum seeks an interim communications director and development associate to work full time from May 16 to October 11, with training to begin May 3. Successful candidates will have experience directing public perception of an organization as well as overseeing flow of information through the organization from print and internet to broadcast and other media. As publicist, this person is the primary contact for press and press screenings. He or she will also work closely with program and studio directors to execute marketing and promotions plans for exhibition, education and artist support programs. This position oversees publicity and promotions interns and volunteers and will work with the executive director on making budget decisions for publicity and promotions. As development associate, which represents 20-25% of the work, this person will work with the executive director on benefits, parties and events, up to two per quarter, focusing on details as well as organizational awareness that the events help shape. He or she will oversee the volunteer coordinator and the membership coordinator, working to recognize memberships and donations in a timely way. Successful candidates will demonstrate great writing skills, experience in planning successful events, have strong knowledge of Photoshop, Microsoft Office, Dreamweaver and Constant Contact, have a working knowledge of HTML, and work well in a dynamic and sometimes quickly changing office environment. Interested candidates should send a resume and cover letter to lyall@nwfilmforum.org with Attn: Interim Communications in the subject line. Candidates may also send applications by post to Northwest Film Forum, 1515 12th Avenue, Seattle WA 98122, Attn: Interim Communications. Deadline is April 18, 2011. 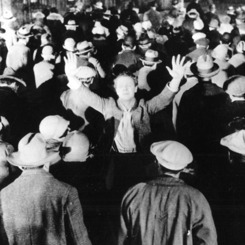 Seattle Theatre Group (STG) and Northwest Film Forum present Trader Joe’s Silent Movie Mondays this April at The Paramount Theatre in Seattle, Mondays at 7pm. This all-classic silent film series, I Love New York, is accompanied by live music from the historic Mighty Wurlitzer Organ, one of the last three remaining organs of its kind to reside in its original environment, played by critically acclaimed organist Jim Riggs. The 1927 masterpiece It stars Clara Bow as Betty Lou Spence, a poor sales girl at a large department store. In this straight-forward Cinderella-esque story, Betty sets her sights on winning the love of the rich owner’s son, Cyrus Walthm Jr. (Antonio Moreno). 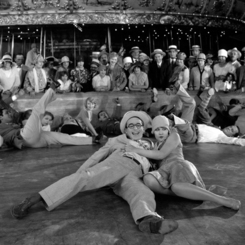 Speedy was both Harold Lloyd’s last silent film as well as his only film to get an Oscar nomination. A fine example of why Lloyd was even more popular than Chaplain or Keaton at the end of the silent era. This fast paced dramatic comedy explores the theme of modernization, pitting the last horse drawn trolley in the city against the evil forces of the transit monopoly. This realistic, bittersweet drama of the day-to-day existence of an ordinary American is as relevant today as it was in 1928, just before the great stock market crash. In director King Vidor’s Academy Award nominated timeless silent masterpiece we see James Murray, an everyman white-collar worker, trying to make it with his wife in the big city of New York. 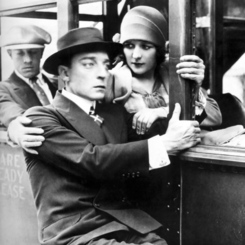 The first film he made after moving to MGM, The Cameraman is arguably Buster Keaton’s last truly great work before the studio system stifled him. Here “The Great Stone Face” is cast as an aspiring, but lousy, newsreel cameraman in quest of the perfect shot, and, of course, the requisite pretty but oblivious Keaton ingénue. When we at Brown Paper Tickets and Northwest Film Forum heard the news about the disasters impacting Japan, we were not satisfied to sit idly by and act as passive witness to tragedies unfolding on our screens. Our brothers and sisters in Japan need our help. We can do something. You can do something. Small acts can create huge positive impact. Even an ocean away from Japan, we can pool our energy, resources and love to make a difference in the lives of those affected by these recent catastrophes. Simply by attending a great movie in Seattle, you can help the relief efforts in Japan. Brown Paper Tickets and Northwest Film Forum present the Seattle Premiere of Yosuke Fujita’s comedy Fine Totally Fine with 100% of the proceeds going to the Support Japan – GAMBARE relief fund set up by Pictures Dept. president Yuko Shiomkaki. Donations to this fiund will be distributed by Japanese aid organization JustGiving and go to help those fighting to put their lives back together. Director Fujita has made a truly feel good indie comedy with his story of Teruo (YosiYosi Arakawa), a tree trimmer whose mission in life is to make the scariest haunted house experience in Japan. He enlists the help of his best friend Hisanobu (Yoshinori Okada), a hospital administrator, in his bone-chilling plans, but Hisanobu is starting to doubt if two guys heading into their 30′s should really be spending their time trying to scare the life out of people. The lives of these two friends takes a turn when accident prone artist Akari (Yoshino Kimura) comes to work at Hisanobu’s hospital. Can wanting to terrify people, growing up and falling in love co-exist in these two slackers’ lives? All Your Base Are Belong to GALA-GA – our annual fundraiser and after-party! Mark your calendars for Northwest Film Forum’s annual fundraising gala, held this year at the lovely Georgetown Ballroom. Festivities will include a galaxy of game playing, films & filmmakers to go with them, delicious food and delicious people, and of course a giant spaceship ready to zoom away with your exuberant generosity. Join us for the after-party beginning at 10pm! Dance the night away to tunes by 80s Invasion, enjoy galactic cocktails and raise money for the Film Forum. At the Georgetown Ballroom beginning at 10pm. Posted in Uncategorized | Comments Off on All Your Base Are Belong to GALA-GA – our annual fundraiser and after-party! Movies are just fluff, right? Rest stops for escapism before easing back into our daily routines. They rouse our emotions for a short while, but the fire cools soon after. Rarely do we allow them to adjust our actions and change us in some fundamental, lasting way. If a film possesses this revolutionary spirit, it would surely rock the sociopolitical order. Filmmaker Joe O’Connor is working on his own “revolution” of sorts, with the perfect city as his stage: our state capitol. He wrote and will soon direct “The Day the Revolution Came to Town,” a parable on the power (and danger) of ideas. His protagonist, an Everyman generically called Guy, disrupts the status quo and ends up fighting for his life. For inspiration O’Connor watched other anarchist films he found inaccurate and unsatisfying. According to him, while these pictures “deliberately mislead the audience” by portraying a hate-spewing, destructive outsider, he “wanted to turn [this] image on its head by showing how mainstream society is violent to those who do not neatly fit into it.” Law and order may quell the opposition born on its fringes, but it also breeds that same intolerance at its very core. Already O’Connor has disproved my theory; film did in fact spur him to action, responding with his own reactionary art. Maybe when “Revolution” comes to town (hopefully in regional festivals this year), his work in turn calls others. To join this project, cast and crew auditions take place on two separate dates: April 3 from 12-4 P.M. at Seattle Center’s Theater Puget Sound (Room B); and April 10, same times, inside the Evergreen State College Communications building. For more information email oly-imc@riseup.net.